Best way to get coupons for Mimi’s Cafe restaurants is to join their e-club.. Right after joining you should get an exclusive one time coupon, plus you will enjoy great future offers and specials on their menu items through out the year. Simply sign up for Mimis eClub and receive a 2-pack of Mimi’s classic muffins free with a $5 minimum purchase, plus receive their special offers and more coupons. Dine In Only: Head on over to Mimis Cafe and get $1 off any trio combo of appetizers. Coupons must be printed and presented when ordering. 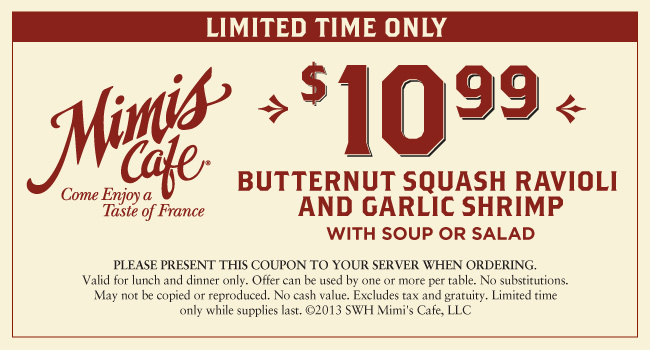 Enjoy a butternut squash ravioli & garlic shrimp meal plus a soup or salad for only $10.99. Mimi’s is a French-inspired restaurant that cooks up traditional fare and café classics. Their pasta sauces are homemade and their dishes are prepared with French cooking techniques and ingredients. Enjoy Salade Nicoise, Brioche Croque Madame, or Crème Brulee Cheesecake with fine taste and a low price with our coupons.